A fresh Notification had been announced by the State Bank of India (SBI) for the Recruitment of 7740 Clerk vacancies in its 5 Associate Banks.So, this is a good opportunity for all those who are aspiring to make a career in the Banking Sector.Although the Clerk vacancies are announced the associate banks, yet these vacancies fall under the SBI Group.It is important to know that SBI is the Largest public sector bank of India with nearly 15000 branches.SBI Associate Clerk Recruitment 2012 is a good opportunity for those who missed the SBI Clerk Exam held in May-June, 2012. In 2012, SBI is on full hiring spree as it had announced 17240 vacancies for Clerks with in 6 months.Earlier in March 2012, SBI had invited applications for the 9500 Clerk vacancies (8500 Assistants and 1000 Stenographers) and the SBI Clerk Exam 2012 was successfully conducted in May-June 2012.Now these students are waiting for their SBI Clerk Exam Result 2012.SBI Associate Clerk Recruitment 2012 comes as a surprise for all those who are waiting for the SBI PO Recruitment 2012, Earlier it was expected that SBI will conduct the PO Exam in 2012, But now with the announcement of SBI Associate Recruitment 2012, SBI PO Recruitment now seems to be postponed till the end of 2012. Educational Qualifications: Min 60 % marks in HSC Part-II (12th Class) OR Graduation in any discipline from a recognized Indian University. It is expected to test the Local Language Skills of the candidates, some Questions may be asked in the Local language. 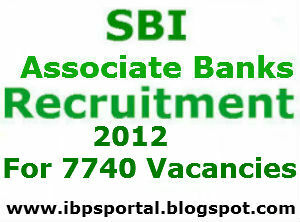 How to Apply for SBI Associate Clerk Exam 2012 ? Application Fees: An application fees of Rs 350 (For Gen/OBC) and Rs 50 (For others) will have to paid either through Online or Offline mode. Website: Log on to www.sbi.co.in and then Click on the Recruitment Link on the left Sidebar. Online Application:Choose the appropriate link for filling the Online Application form and there after choose your Payment Option. For Offline Payment: After filling the Online application form, System Generated Payment Challan form will be produced that must be printed and used for depositing the application fee in any SBI Branch before 17th Aug, 2012.Fee must be paid from 2nd of Online Reregistration and with in 3 working days. For Online Payment: The Payment Gateway is integrated with the Application form and after submitting the Online application form you will be redirected to the Payment Gateway Page, where you can Make the Payment through Online mode viz Internet Banking and Credit or Debit Card.